Chevrolet's new small SUV - the Trax - is now on sale with prices starting at £15,495. That gets you the 1.6-litre petrol engine with two-wheel drive in LS trim. 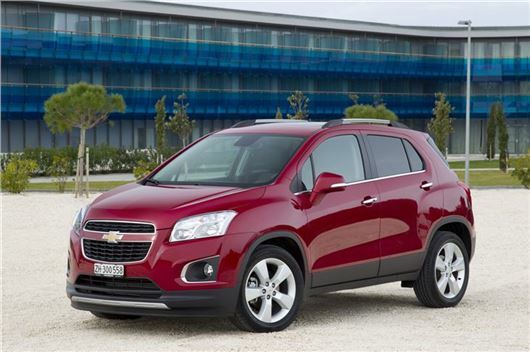 The Trax is the sister car to the Vauxhall Mokka but the entry-level Chevrolet is £500 cheaper than its counterpart. We've already driven the Trax but were distinctly underwhelmed, especially when you consider how good the competition is. And these prices do little to make it more appealing. The Skoda Yeti is cheaper and better value as is the Nissan Juke. Standard equipment levels are pretty good though with the LS getting 16-inch alloy wheels, air conditioning, stability control, electric front windows, cruise control, privacy glass, front fog lights, parking sensors, Bluetooth and Hill Start Assist. The LT starts at £17,495 and adds a seven-inch touchscreen, steering wheel stereo controls, 18-inch alloys, hill descent control, a leather steering wheel, rear parking camera and electric rear windows. Three engines are available on the LT. A 115PS 1.6 petrol and a 140PS 1.4 turbo petrol or 1.7-litre VCDi diesel with 130PS, with either an automatic or manual gearbox. Both the 1.4 Turbo and 1.7 VCDi are available with all-wheel-drive. Yes, it doesn't compare well to the competition but it will probably come with significant discounts. Buick Encore in N. America is a plus!